FDP Forum / Fender Bass Guitars and Bass Amps / Fretless basses - J or P? 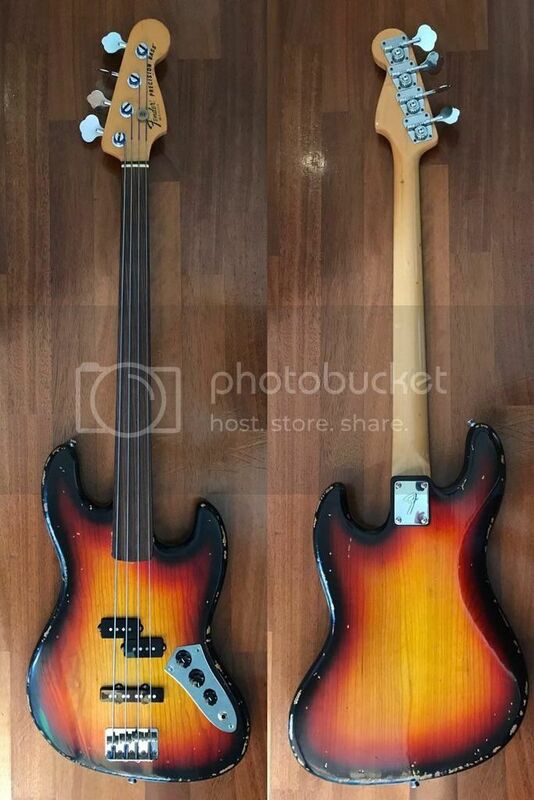 Am I correct in thinking that most of the fretless basses I've seen have been Js? If so, are there reasons beyond Jaco? A fretless bass is automatically going to have a more muted tone than a fretted because of the damping induced by the left hand fingertip and because they are usually strung with flats. That doesn't bother me, because I use my fretless P to emulate the sound of an upright bass. But some may want the option to bring back more brightness by using the J's bridge pickup. And there's always the option of a fretless P-J like the Fender Tony Franklin model. In the seventies, fretless Ps were more common. Nowadays they do seem to be mostly Js. I’ve got a frankenfretless made of a Tony Franklin neck on a mim active deluxe J body. Really allows fora nice tone by boosting mids. It has Labella flats.